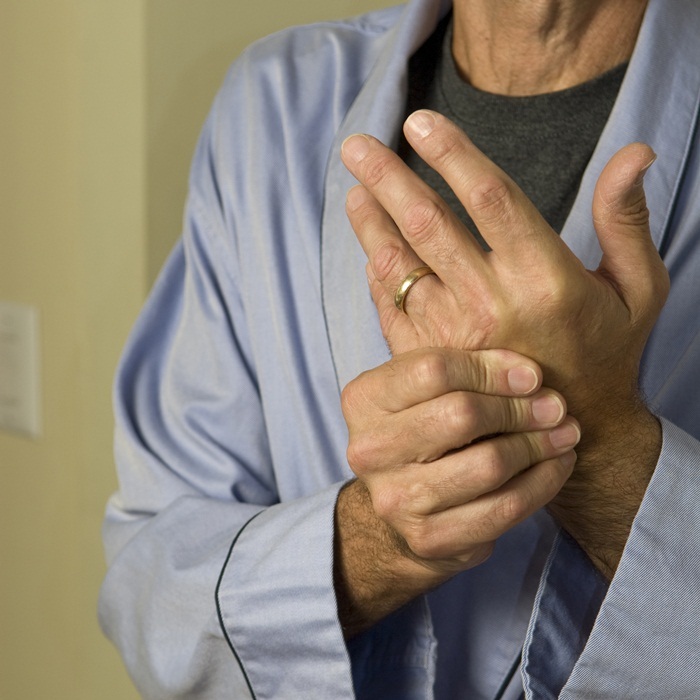 Arthritis is a common condition which affects millions of people living in North America. This condition is quite common and generally targets people over 50 years of age. The most common type of arthritis is the degenerative form where the joints of the spine, knees, or hips are affected. In this type of arthritis, swelling, pain, stiffness, joint enlargement, and joint cracking can commonly occur. Osteoarthritis is a type of degenerative arthritis except the smaller joints like the hands, wrists, feet and ankles can also be affected. In this case, the finger joints can become enlarged and hand motion may be restricted with gripping becoming more difficult. Certainly, harsh weather can aggravate arthritis symptoms so during the winter months it is very important to dress appropriately. I recommend wearing long cotton underwear as a layer under your clothes to provide extra insulation and warmth during the winter months. When you do go outside, wear a hat that covers your neck and good quality gloves or mittens to protect your hands. Every day, take a warm bath with Epsom salts or eucalyptus essential oils as this will keep your joints supple, allowing movements to be less of a problem. If your hands are the main problem, you can soak your hands in Epsom salts as well—this may be quite helpful in the morning when your hands may be the stiffest. Some people become less active in the winter months and this can be a mistake, as the symptoms of arthritis will improve with regular exercise. There are many activities you can do indoors including swimming, fitness clubs, fitness classes, or a home exercise program. The important message here is to maintain your regular level of physical activity despite the cold temperatures. Regular physical activity keeps your joints strong and mobile and will also decrease the level of pain and tightness—as well as improve the joint ranges of motion. I have always considered food to be a great way to help with arthritis pain. Foods I would recommend would be salmon, mackerel, sardines, and herring. This fish is very high in omega-3 fats which have powerful anti-inflammatory properties. Consuming two to three servings of these foods every week will help decrease the joint symptoms you may experience. If you like curry, you may want to use turmeric spice in your diet more frequently, as the yellow pigment curcumin contained in the turmeric is a powerful anti-inflammatory and can decrease your pain and swelling. It is also very important to limit your intake of saturated fat from red meats, butter and cheese and sugar as these foods can encourage the inflammatory response and actually increase your arthritis symptoms. Murray, M., et al., Encyclopedia of Naturopathic Medicine (Prima Publishing, 1998): 695-705.